This is the second Workbox I have made and, boy, do I wish I had taken photos and made a record of what did last time! 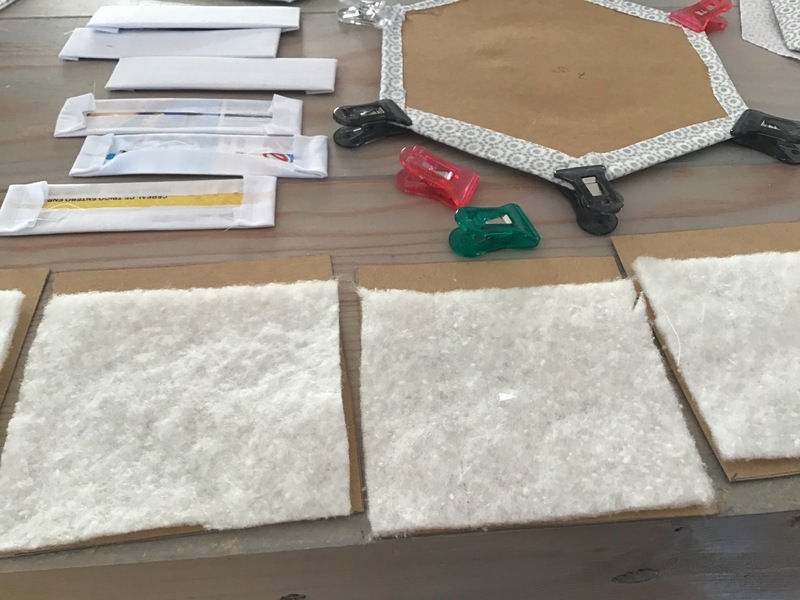 The Workbox will take you several hours to make, cutting out the various components, sticking the bits together and then both hand and machine sewing. 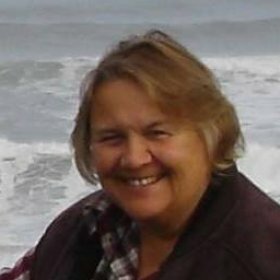 ….. so give yourself plenty of time! I strongly recommend you mark each piece of card, for the sides outer and lining, mark those with an arrow to indicate which way up they are. 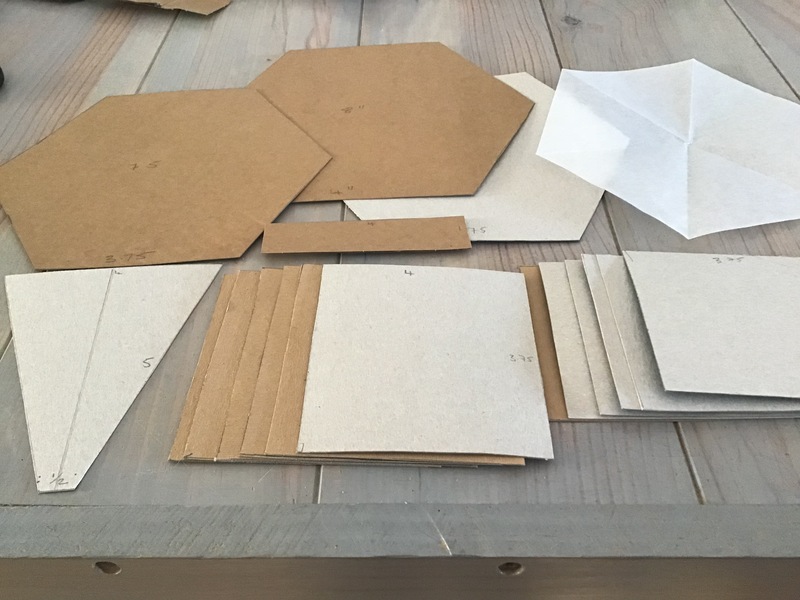 If you intend to make any more boxes after this one, in addition to the card shapes you need for this one, cut one additional piece of card for each shape, and set these aside as templates. Mark as such to avoid any possible confusion. 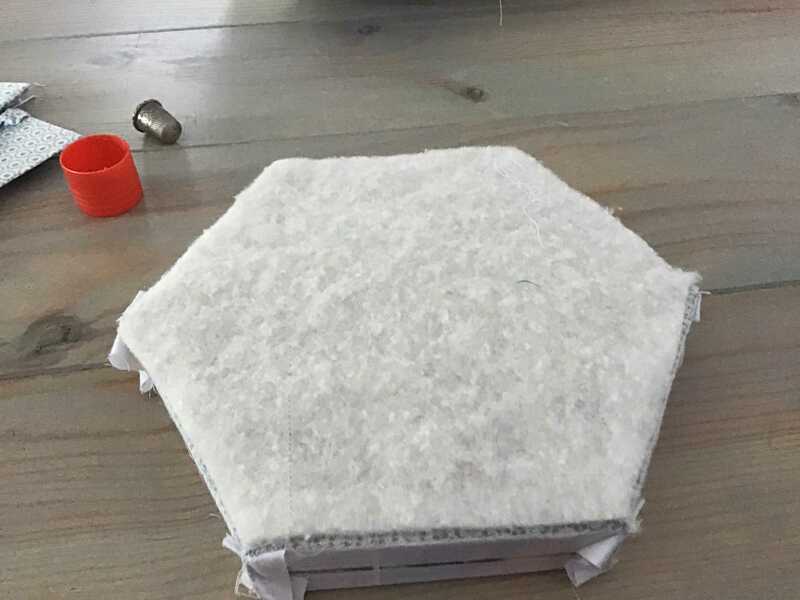 For the hexagon shaped lid, base and insert, use an 8 inch circle of paper and fold it in half and then into 3. Then cut off the top arch so that the 6 sides each measured 4inches. Cut 2 hexagon shaped pieces of Main Fabric for the 8 inch Hexagon leaving a good 1/2inch extra for overlap. Refold the template and cut down a further half inch or so, so that the 6 sides now measure 3.75 inches across. Cut out 1 piece in the Main Fabric and 1 in the contrast Fabric, again allowing about a half inch extra for overlapping. Cut 6 pieces of Contrast fabric for the inner sides, again allowing extra half inch for overlapping. Fold your Main Fabric in half, lengthways, and cut 6 Gusset shapes putting the 4 inch along the fold. 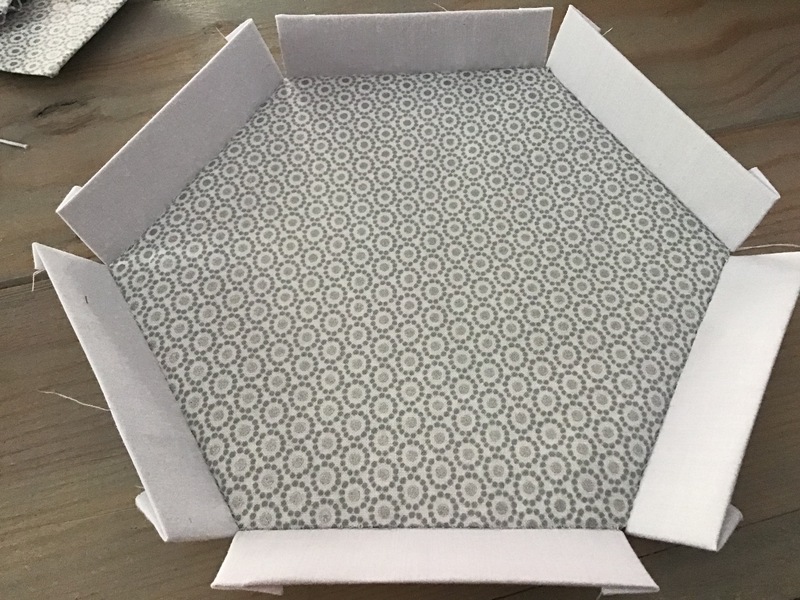 Cut 6 pieces of Contrast Fabric to cover the 1 inch x 4 inch box lid brim. When beginning to cover any of the card shapes, stick the fabric or batting to the side that hasn’t been labelled – this will make it easier to remember which section is which. Do groups of similar shapes together, to avoid confusion. 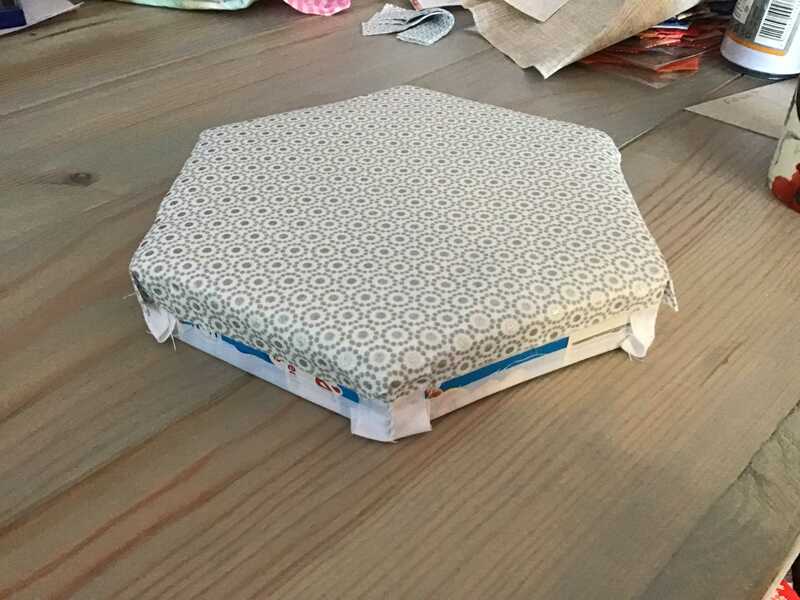 Cover the base hexagon (7.5 inch) with a piece of wadding (cut slightly smaller than the actual size) and then in your Main fabric. Cut the fabric with a generous half an inch of turning all around, and use the stick glue, fold in opposite sides each time, neatening the corners as much as possible, keeping them as flat as possible, (use more glue to do this, if necessary). Have a damp cloth handy, it’s good for wiping fingers to keep work clean. Cover the base lining hexagon (7.5 inch), sticking a layer of batting on the card first, then pulling the contrasting fabric over the batting and gluing as before. The lid hexagon (8 inch) is covered in a similar manner, with a layer of batting, then contrasting fabric. Lid brim card shapes are covered in contrasting fabric without batting. The 6 outer box sides need to be covered by the batting and outer fabric. Avoid the top one inch of each side, or the lid might not fit. This was the reason for drawing arrows on the sides right at the beginning, because the sides are just a little taller than wide, and it’s easy to get the placement of the batting wrong. Glue it in place, then cover the sides with the outer fabric. Cover the 6 inner sides with the Contrasting fabric in the same manner but excluding the batting. Some stitching is needed now. Cut from Main fabric: 4 strips of 7 inch x 2 inch, fold lengthwise and sew with quarter inch seams. Turn to right sides out, and thread with 9 inches of elastic. Cut 2 of 7 inch x 4 inch Main fabric for gathered pockets. Turn under a half in seam allowance, turn down again another half inch and sew in place. Thread through with 9 inch elastic. Secure the ends of the elastic with a safety pin at either end. 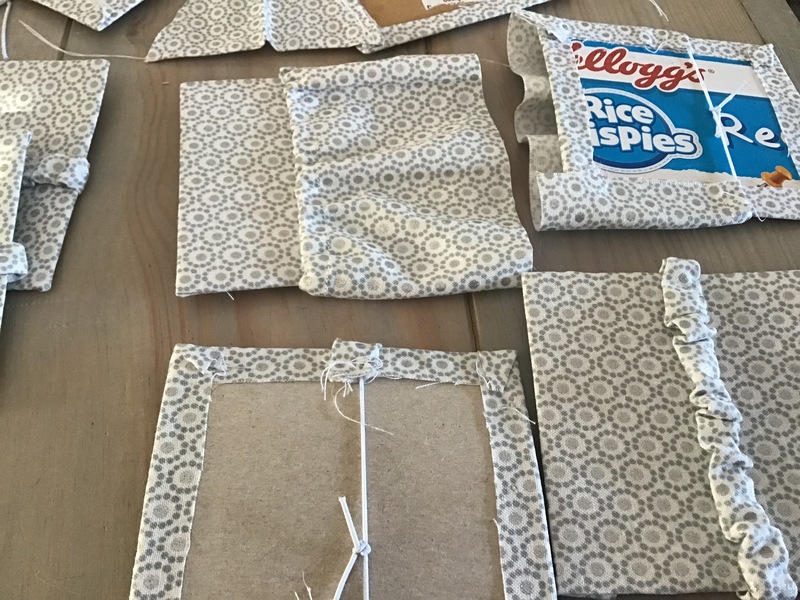 Gather each pocket sufficiently to leave half an inch on either side, and glue to two of the padded box linings, approximately 2 inches down from the top. Secure the elastic to the back with glue, and a few stitches at each side. With a running stitch, gather the bottom of the pocket, evening out the gathers as much as possible, turn the bottom of the pocket to the back and glue to the inner side of the lining side. 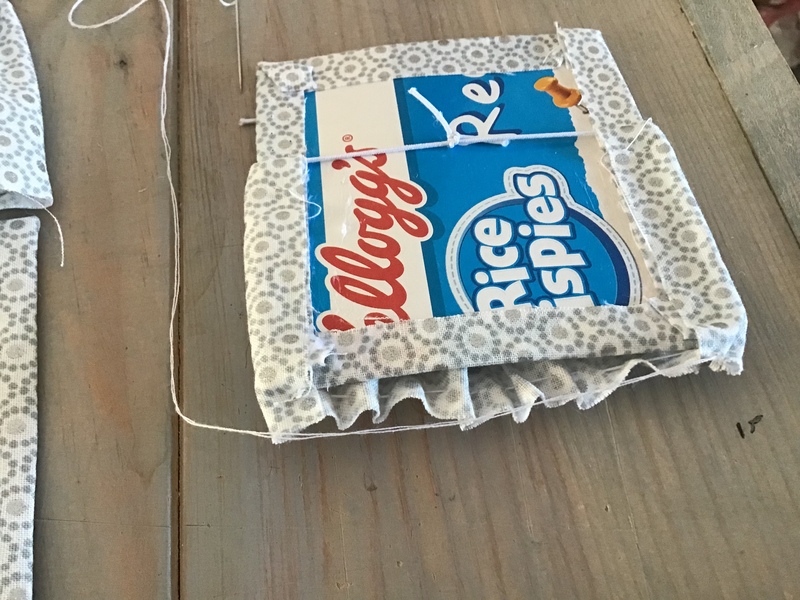 The other 4 sides of the box have the elasticated strips to secure reels of thread, for example, and are attached in a similar manner, with glue and a few stitches to the back of the lining sides. Hand sew the lid brim linings, right sides together, to the hexagon lid, sew all the long sides first, then return and sew the short sides of the brims, to form the lid shape. The outside of the lid is then covered with a layer of batting, then the Main fabric. Glue this in place, over the brim lid, and hold with pegs and allow to dry. PLEASE SEE PART TWO FOR COMPLETING ASSEMBLY OF THE WORKBOX……. I am looking forward to part 2! Really succinct and well illustrated. I have often thought of doing this, now I have no excuse.